Google Image Search is used by millions of users to search images daily, and websites that have frequent usage of images may receive good traffic from there. If you are a webmaster, and if you are focusing to increase traffic on your site, this small but important tip is recommended to keep in mind. Image searches like Google provide users with a collage or grid of images on a query. When a reearcher or user click an image, the image is displayed in an iframe version with the image source site in the background. Now it’s on user to use the image straight from there, or to visit your site for more. In short, that iframe version of your image is restricting user to come on and explore your site directly. And if you have many hundred of images indexed on Google, you might have been losing a good amount of traffic from Image search due to this restriction. Can I redirect traffic from Google Image Search back to my site? “Yes, you can!” “So, what’s the catch?” Well, the trick is to redirect users from that iframe version of Google Image Search to your site directly. So, how to achieve that? You need to play with the code a little bit (don’t worry, it’s not that hard) to break out of frame. Paste this code just before the closing head tag (</head>) in the markup (HTML) of your website. Save changes. Now, search an image that is on your site, click it, you’ll see that the iframe version of the image is redirecting to the source site i.e. your site. 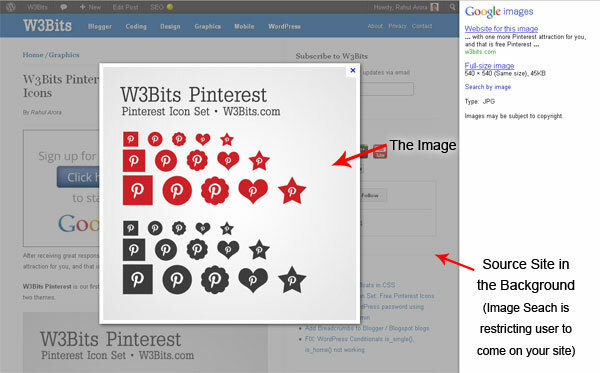 This way, you get plenty of visitors from Google Image Search and other sites who’ve been using your site in an iframe. Since Google has completely changed it’s images search feature, the frame breaking scripts won’t work for you anymore to get traffic redirected from there. The new Google Image search doesn’t have frame based implementation to show images from sites. Here are few more alternatives you should see to recover traffic from Google images. We can’t redirect our images on Google searches to our own site itself. But some plugins for WordPress provide a better solution – these plugin can put a watermark on images indexed on Google Image Search and will redirect visitors to your site when they click the “View Original Images” button. However, I can’t guarantee they would work 100% for you. The plugins are Imaguard and Google Break Dance that work similarly to get more control over your search engine indexed images and redirection. Go try them and let me know how they are working for you.